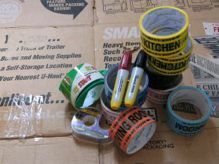 If you have decided to do your own packing or even partial packing, you'll need some packing supplies. Packing isn't what it used to be crumpled up newspaper and the likes. Manufacturers have developed new lines of sophisticated packing supplies to allow the untrained packer to easily pack items while providing maximum protection. It's a good idea to start collecting your packing materials about 6 weeks prior to your moving date. Having these materials at your disposal with enough time before your move will allow you to pack just a few items every day and still be ready on time. If your looking to save a few bucks, you can start collecting used boxes to minimize the expense of purchasing new ones. Try your local grocery and liquor stores for boxes they no longer need. Speak with the grocery store manager and ask him when they usually get shipments and if he can keep some boxes with covers aside. Liquor boxes are great as they are manufactured to protect glass bottles. These are tough boxes and can be used for breakables such as vases and crystal. Boxes used for electronic appliances and computers are also good, heavy-duty boxes great for moving. Usually these cartons are used only once, so you can probably expect them to be in good condition. If your budget is not a concern or you have run out of time, you canpurchase new moving boxes at a variety of different stores. Shipping stores like UPS or FedEx will usually carry enough boxes for your moving needs. If not, you can try truck rental services like Uhaul or Ryder. You may also find boxes at local storage facilities. Moving boxes come in all sizes and shapes to fit the different items you need to pack. You can find specially designed wardrobe boxes that allow you to hang your clothes and dish packs that are well padded to protect your kitchenware in transit. Keep in mind you should reserve smaller boxes for books and heavier items to avoid strenuous movement and possible damage in transit. If you don't have time to go pick up materials, or you just don't want to deal with the hassle, you may consider purchasing your packing materials directly from your moving company. Your moving company representative will be able to provide you with an accurate list of required supplies based on your inventory list. They may even be able to provide you with a bulk of boxes and only charge you for the ones you use. Whether you purchase your packing supplies from your moving company or from a store, be sure to purchase some extra supplies just to be safe. Most shipping supplies stores and moving companies will refund any unused materials that you return.